Not sure whether to put this in with the chicken questions....or the pastry. I have good recipes for cpp fillings...but I always have trouble with the crust on top. It usually comes out too hard. What am I doing wrong? Is there a recipe out there that calls for pouring a batter on top of the filling and letting it cook into a bread top? Does cpp usually have a bottom crust also? I really love eating this meal...beef pot pie...the veggies...gravy...bread...meat...hmmmmmm oh! I spilled some gravy on my shirt! Please post your recipe. It's much easier to troubleshoot that way. Do you have access lard? It makes the *best* pie crust. Pot pie does usually have a bottom crust. I make an 8-inch, deep dish turkey pot pie right after Thanksgiving. I just buy Pillsbury pie crusts from the refrigerated or frozen foods section of the supermarket. Some pot pies have a bottm crust, such as Marie Callender's, while some don't, for example Kentucky Fried Gerbil's and Boston Market's chicken pies. It is also common to place the filling in an oven safe container such as a casserole dish, drop dollops of biscuit batter or refrigerated biscuits on top, and bake it in the oven. He lives in China. I'm not sure they have frozen pie crusts there. I use the old Betty Crocker’s pie crust recipe and it always seems to work out well for me. I use a crust on top and bottom for pot pie using crisco shortening, but lard is the way to go as my mother always swore by that. 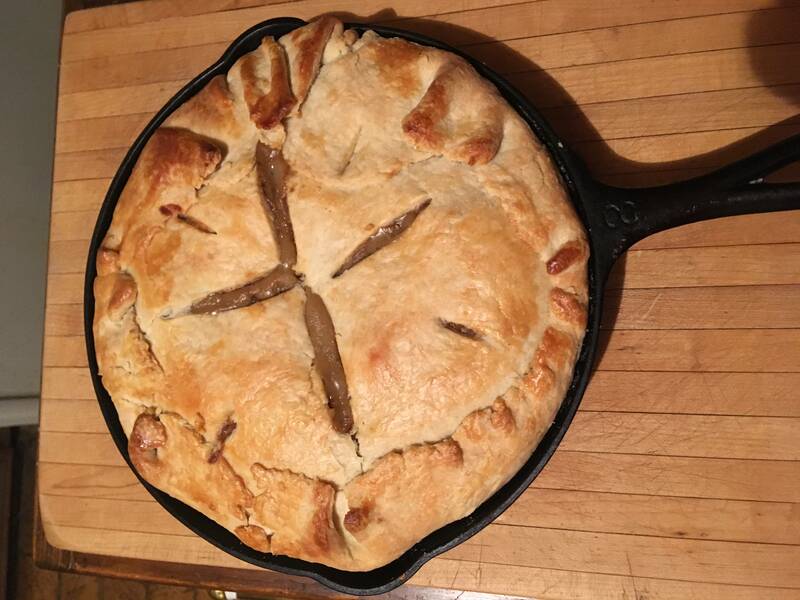 Most of the time I do chicken pot pie but this one I made a beef pie since I used a skillet and beef I left the top more rustic looking instead of usual pinched edges. I think I did a egg wash and just folded it over and let them sit to cool a bit and firm up some. I have used puff pastry sheets on the top only at times , but always like regular pie crust for bottom and the top. So do I. Only, I do brush each layer with melted butter. Or sometimes when I am feeling lazy, I just put nice chunks of cold butter between the layers. for the times I make my own crust, I use a combo of ice cold lard and butter. Nice flaky crust! Addie, I think you're talking about sheets of phylo dough, not puff pastry. Puff pastry is more like an airy pie crust rather than thin sheets of paper. Bingo! Can't do the instant mode. In a large bowl, combine flour and salt. Cut in butter until mixture resembles coarse crumbs. Stir in water, a tablespoon at a time, until mixture forms a ball. Wrap in plastic and refrigerate for 4 hours or overnight. Roll dough out to fit a 9 inch pie plate. Place crust in pie plate. Press the dough evenly into the bottom and sides of the pie plate.